“Midnight Sun” does what it means to do for the people it means to do it for—and that might just be enough. Xeroderma pigmentosum—a one-in-a-million skin ailment that makes exposure to the sun’s rays potentially deadly—wouldn’t necessarily sound like the sexiest starting point for a life-changing love. 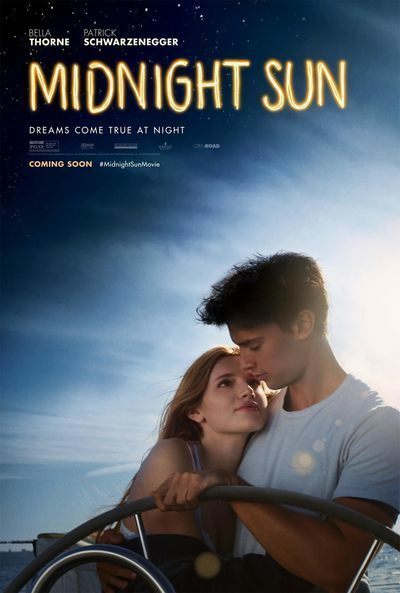 But “Midnight Sun” has the benefit of photogenic, charismatic co-stars in Bella Thorne and Patrick Schwarzenegger, who have enough likability and chemistry to make this high school weepy more tolerable than it ought to be—for a while, at least, until it goes off the rails and turns unbearably schmaltzy in the third act. Both actors are gorgeous, of course, which heightens the romantic fantasy of it all, but there's also a naturalism to them that's appealing. Thorne brings her well-honed Disney Channel comic timing to the role of Katie Price, a bright and talented young woman whose condition—XP, for short—has kept her cooped up during the daytime for the vast majority of her 17 years. (The script from Eric Kirsten allows Katie to explain her situation quickly and efficiently in narration off the top.) Katie’s widower dad (Rob Riggle, solid in a rare dramatic role) has taken every precaution to protect her from sunlight, from heavy-duty tinted windows in the house and minivan to extra security on the front door. We learn in an early conversation between him and Katie’s doctor that it’s actually a miracle she’s lived this long. But out that fortified, second-floor bedroom window, Katie has spied on her neighbor, Charlie (Schwarzenegger in his first lead role), skateboarding down the street every day for as long as she can remember and adored him from afar. On high school graduation night—which Katie and her dad commemorate with their own home-school version—she and Charlie finally meet cute at the train station in their quiet suburb, where she’s allowed to sing and play guitar at night and he just happens to be passing by on the way home from a party. Understandably, she tries to keep her disease a secret from him over a series of nighttime dates, just to experience the joy of feeling like a normal person for once. This would be a good opportunity to stop and acknowledge how impossibly wholesome “Midnight Sun” is, but that’s also what makes it kinda refreshing. The movie exists in an alternate universe in which the hunkiest, most popular guy in school also happens to be smart and sensitive—and of course, he prefers the sweet, sheltered Katie to the beautiful, bitchy cheerleader who’s after him. He’s a modern-day Jake Ryan. All these characters ever do is share chaste kisses and—at most—go night swimming in their underwear. Even the obligatory raging kegger is shockingly bereft of house trashing and projectile vomiting. But taken to an extreme, that sweetness can be cringe-inducing, as in the scene in which Katie finally gets the guts to busk in front of a crowd when Charlie takes her out on a big-city date in Seattle. People of all ages and ethnicities suddenly appear, clapping and bopping and smiling at each other as she sings her peppy pop song. It was hard to look at it head-on—I almost needed one of those shoeboxes with a pinhole in it, like you’d use to view an eclipse. And that’s just a harbinger of things to come as Katie’s body deteriorates, but her magical powers of love and inspiration seem to grow exponentially by comparison. Having said that, Katie and Charlie push and support each other to overcome their fears and be the best they can be—her with her musical dreams, him with his competitive swimming and college aspirations – in a way that’s worthwhile. But I wish Quinn Shephard had more to do beyond functioning as Katie’s wisecracking best friend. Shephard is a force to be reckoned with in the psychological thriller “Blame,” both in front of and behind the camera, and she brings a lot of presence and personality to a one-note role. And as she and all the other characters in Katie’s orbit ultimately learn, love means never having to say you’re sorry. But you might be sorry you stepped into “Midnight Sun,” depending on your age.